Às leth Luchd-obrach Gnìomhachail an t-Saoghail (IWW) dha bheil sinn gu math càirdeil seo agaibh a’ chiad tionndadh Gàidhlig air an Ro-ràdh ainmeil aca a chaidh a dhèanamh le aon de na buill againn. Crìoch don t-siostam-thuarastail! 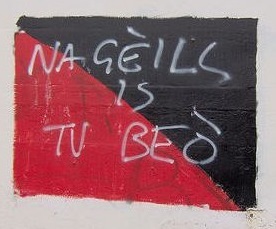 | On behalf of the Industrial Workers of the World (IWW), a union we’re friendly with, here’s the first ever Gaelic translation of their famous Preamble (which you can read in English here) written by one of our members. Abolition of the wage system! Faigh a-mach tuilleadh mun IWW ann an Alba an seo. | Click here to find out about the IWW in Scotland. Chan urrainnear an càradh seo atharrachadh agus math an luchd-obrach a sheasamh ach le eagrachadh a tha air a dhèanamh air dòigh ’s gu bheil a h-uile ball a tha aige ann an gnìomhachas àraid, no anns a h-uile gnìomhachas ma tha e deatamach, a’ sgur a dh’obair uair sam bith a thachras stailc no às-ghlasadh ann an roinn sam bith den ghnìomhachas, a’ ciallachadh gur e leòn aoin leòn na h-uile. An àite na h-abairt shàbhailte, “Pàigheadh latha cothromach airson obair latha chothromach” ’s e a dh’fheumas sinn sgrìobhadh air ar bratach ach an sluagh-ghairm rèabhlaideach “Crìoch don t-siostam-thuarastail”. ’S e dleastanas eachdraidheil a’ chlas-obrach a bhith a’ cur às do chalpachas. Feumaidh airm an dèanaimh a bhith eagraichte, chan ann a-mhàin airson na strì làitheil ri calpairean, ach cuideachd gus dèanamh a chumail a’ dol às dèidh do chalpachas a bhith air a thilgeil sìos. Le a bhith ag eagrachadh gu gnìomhachail tha sinn a’ cruthachadh structar a’ chomainn-shòisealta ùir ann an slige an t-seann chomainn-shòisealta.